Let's keep this one short. He sheepishly admits that he feels that reading Infinite Jest has been bad for me, is making my depression worse. The 1079-page David Foster Wallace tome does nothing of the sort, I tell him, rather the problem is my relationship with my father (one can do only so much) and his death. Everyone knows this, certainly him, but FD sees me reading this book, and since I don’t see what he sees seeing me, I have to respect that. I never should have told him that David Foster Wallace killed himself. A sucker for detective novels, I put down Infinite Jest and lose myself in a book I can't find to recommend. But I liked it well enough and succumbed to tossing Jest to the pile on the bedroom floor, put it away for the time being. 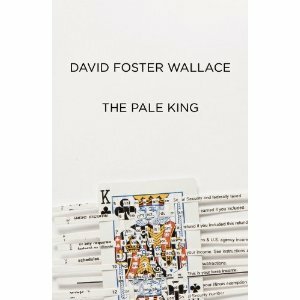 Then today James Campbell's review, A Cure for Head-Exploding Brilliance, about David Foster Wallace’s last novel, The Pale King, comes out, and it's all coming back to me now-- that Foster Wallace jones. Mr. Campbell captures the author's manic writing style, that head-exploding brilliance, with writer-eze that real writers understand. He uses words like maximalist. This is a hint to Hal, Hal Incandenza of Infinite Jest, a teenager who knows words, all words, for he has memorized dictionaries, all of them, and can cite their differences. Harold Incandenza, boy word genius, is addicted to marijuana, plays tennis, and loves his mom. His father, a brilliant filmmaker has taken up with Hal’s brother’s girl friend who will wear a mask half-way through the book to hide facial disfigurement suffered in an attempted suicide. The "accident" is masked as a crack cocaine overdose. Hal's father is also a casualty of suicide, which is perhaps one reason our young hero smokes so much pot. The method, not for the feint of heart. Which is why, perhaps, FD told me to put down Infinite Jest. I was on page 795. Almost there! Which is why I read as much as I did. Those open seas. That and the 12-Step die-hards and their meetings. For realism you don't get any better. I bring this to your attention, because of that word, maximalist-- for nothing goes to the cutting board (no dropped claims here). See what I just did there in the parentheses? No dropped claims here has absolutely nothing to do with this story, except that those of you who still send paper claims to third party payers know exactly what it means and find the line hugely entertaining. Maybe not. A dropped claim is a bill to an insurer that "falls" to the floor, is never processed, and is swept away by maintenance personnel at midnight. The provider of service is never paid. (That would be your therapist). Now, if no dropped claims here had anything remotely to do with a story line, a maximalist would keep it. That’s what it is to be a maximalist-- no editing because the road, the process, the way-to, at least to the author, and clearly to millions of literary fans, is worth the trip. This flies in the face of everything FD has taught me about how to write, for he taught me, and he learned from the best English teacher in the country, Helen Kuentsler, native to that blue-collar Illinois town with the better education across the Mississippi. Ms. Kuentsler taught The Elements of Style (EB White's reprise of the William Strunk's 1918 original) and FD memorized the book. Editing one's words is what a good therapist does, by the way. So I assumed that those of us who refused to edit enough, who wrote ad nauseum without a care in the world, were just stupid. Nobody wants to read so much blather, honestly, and few of us are as entertaining as David Foster Wallace, and probably nobody knows as many words. But it isn't about anyone else, let's talk, when we write, which is exactly why a maximalist is a maximalist, and there is nothing, really, to judge. It is why in therapy the therapist doesn't have to say all that much and usually shouldn't. 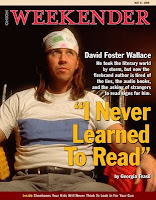 Campbell alludes to Mr. Foster-Wallace's therapy, that he changed there-after and became obsessed with boring as an antidote for his condition, that exploding brain, which is why his last novel is replete with very short sentences. He quotes from The Pale King. "Irrelevant" Chris Fogle turns a page. Howard Cardwell turns a page. Ken Wax turns a page. Matt Redgate turns a page. "Groovy" Bruce Channing attaches a form to a file. Ann Williams turns page. Anand Singh turns two pages at once by mistake and turns on back which makes slightly different sound. David Cusk turns a page. Sandra Pounder turns a page. Another exerpt reveals that most paragraphs are not like this. He doesn't, actually, omit needless words. Scott Adams, creator of Dilbert, same newspaper, same day, reiterates EB White's message. He doesn't even waste words with an honorable mention to the The Elements of Style. In How to Get a Real Education Adams advises us how to get ahead, even if we are only B students. Among his tips: Write Simply. This has everything to do with therapy, I feel. For there are minimalists and there are maximalists, and the therapist must read them both, respect all manners of communication. The minimalists get the max for the minimum, and the maximalists gets the floor, as they should. More therapy, and who knows? Maybe David Wallace Foster would still be with us today. It is early spring here in Chicago, sunny and warm, and as I ride my bike to the office at 8:00 a.m. on a bright Sunday morning, it occurs to me that I really want to read The Pale King, whether the sentences are long or short. It might be therapeutic. For even if I'm not depressed anymore, I can always switch to something, change something for a kick. What I really want is for my landlord to paint the walls of my office Robin Egg Blue. Hello? You out there? S? Loved this post. I have been going through such a hellish funk out here in the middle of nowhere and reading David Foster Wallace and agonising. But it isn't DFW, of course. It is all about my brilliant alcoholic mother's suicide and the lifelong work of getting over that. Robin Egg Blue. What a fantastic colour. It broke my heart, to hear about David Foster Wallace because he committed suicide. It broke my heart doubly, to know that he gave up taking antidepressants, because he felt they dulled his creativity. Because I understand him. There are days when I wonder, if depression and creativity aren't two sides of a coin. And there are days when I wonder, if my choice wasn't the dumbest thing I ever did. Beautiful post - I haven't read Infinite Jest but I do have a inexplicable soft spot for long, rambling, smart novels like Pynchon's "Gravity's Rainbow." There is something about thinking in such complexity, which can make a person feel very powerless. Reflections from an examined life is always worth reading. 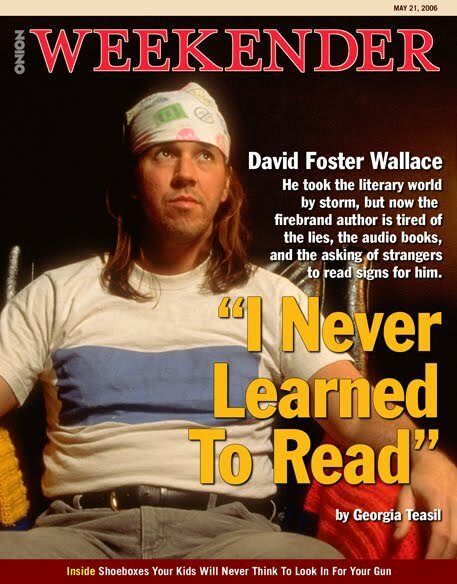 I've only recently begun hearing about David Foster Wallace and haven't read any of his books. I did think his commencement speech to those college kids was brilliant. I'm writing because I wanted to tell you that a few years ago I had an experience of my head exploding and I wanted you to know what that feels like. It wasn't like a bomb went off or anything like you may equate to an explosion, but it was more like a shattering of glass that felt like a definite explosion from my skull outward, as opposed to an implosion. In fact at the time of the explosion, I could hear the glass break (like a whooshing, cracking sound) and literally felt the impact in the form of a rush of wind that literally lifted my bangs from my forehead when it happened. And relief. Instantaneous relief of major pressure build up that had been bordering on migraineous head pain for...days, weeks, and possibly months. I have told two therapy docs about this happening to me and both have looked at me with blank, "I don't believe you" sympathetic looks, so I don't bring it up anymore. Recently, I've been feeling that kind of build up again. I thought I was the only one who ever felt this way until I read your post about DFW. I went and tied a bandana around my head and guess what? It made my head stop hurting so bad. I am a 46 y.o. mother of three. I have a brilliant mind that never stops. Not even when I sleep. My grandmother committed suicide. I will tell you why I think DFW wrote the Pale King IMHO for the same reason I talk to myself in a foreign language that I do not understand when I am alone, I call it jibberish, and I do it frequently while I am driving. It is the only thing that affords my brain any peace. If I talk in that language, it curbs the incessant probing dialogue in my brain. It is the only way to make it stop. IMHO writing page after page of the mundane IRS boring statistical BS was DFW's only way to stop the dialogue that threatened to make his head explode. It's no joke. Really beautiful article. I enjoyed a lot and look forward more post from you. Really, it was great. Thanks for sharing excellent work. The way you think and the way you write about what you think gets to me every time. You make me stop, breathe, think, & think again, and often feel more loudly what was lurking in the corner. Thank you! DFW was someone who told things as he saw them, reality in its realest terms. When I think of the pain of depression, it is sad. So many people can't seem to get the help they need. A bit of tweaking of brain chemistry and some electric shock helped my mother. But for some, they are lost. I am missing you so. Please enjoy the vacation which you deserve. And tonight Greg had a breakthrough.